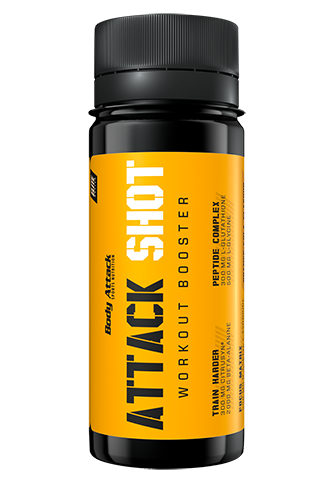 The nutrient combination in the Body Attack ATTACK SHOTs has a lot to offer: it will bring you to a higher energy and performance Level. Which products are advisable to be taken with ATTACK SHOT? Body Attack Extreme Instant BCAA for a better supply of the muscles with BCAA during training. Body Attack CREAZ ATP for an improved supply of the muscles during intensive workouts in strength and endurance sports. Body Attack 100% Whey Protein for before and after training to support muscle growth and maintain muscle mass. Body Attack Creatine Protein – ALL-IN-ONE formula for all those who want to develop even more muscles and strength. Body Attack BETATOR® – the revolution among the muscle growth products - perfect for all those who want even more.